Japanese survey: palm reading is the most accurate fortune telling method! Between the 20th and 22nd of January 2010 1,071 members of the goo Research monitor group completed a private internet-based questionnaire. The results are presented below. Note that the score in the results refers to the relative number of votes for each option, not a percentage of the total sample. Q: Which fortune telling method do you think is the most accurate? Re: Japanese survey: palm reading is the most accurate fortune telling method! Thanks for the post. It sounds good. I like it. This information is really encouraging that palm reading is the most accurate fortune telling method in Japan. It must be so elsewhere too. This will give courage and confidence to many those who have aspirations in making palm reading as their hobby, passion, profession or career. Enjoy! 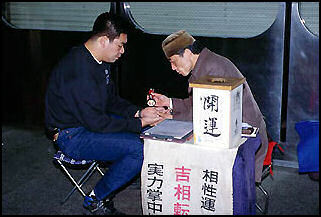 Well Parender, the survey for sure illustrates that in Japan people have rather high expectations regarding palm reading.